Wow! How cool that they are exhausting every avenue to get these lovely birds back to their environment. Thanks for the update deb. Another follow up on the bald eagle. He was transfered from the zoo's hospital to the Raptor Rehab center to continue his recovery. He was found on Memorial Day in a very poor condition with the wound on his head. So he has not flown for a while which is now the reason he is being transfered to the Rehab center to start building up his strength for release and to see how he manages catching his food. Wishing him the best as he gets closer to getting his freedom back. The eagle video is very interesting, Deb. I hope the next phase works out well! i was forced to leave Hornby for the first time since april by an eye appointment that seemed a long way off when it was made but unfortunately approached very quickly! While waiting in the parking lot drinking water & eating a hand made doughnut i remembered that i used to be able to see the Simms Park Nest from here! Here is the best foto from that day. The Tree has sure taken a beating from when i last photographed it! This foto even has an Eagle in the Nest. it appears that the nest also took a beating - sides drooping - was there a big storm? at least the nest is still in the tree! 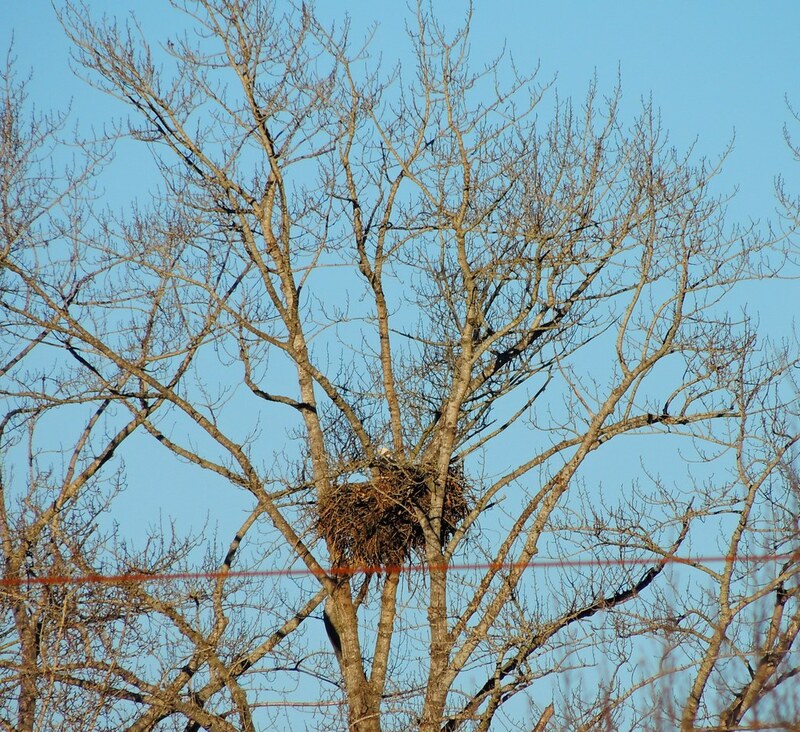 This is how the Simms Nest looked this week. Dawn told me she'd had a quick look on her way through town and there seemed to be a second pile of branches below the nest, in the next crook of branches below. 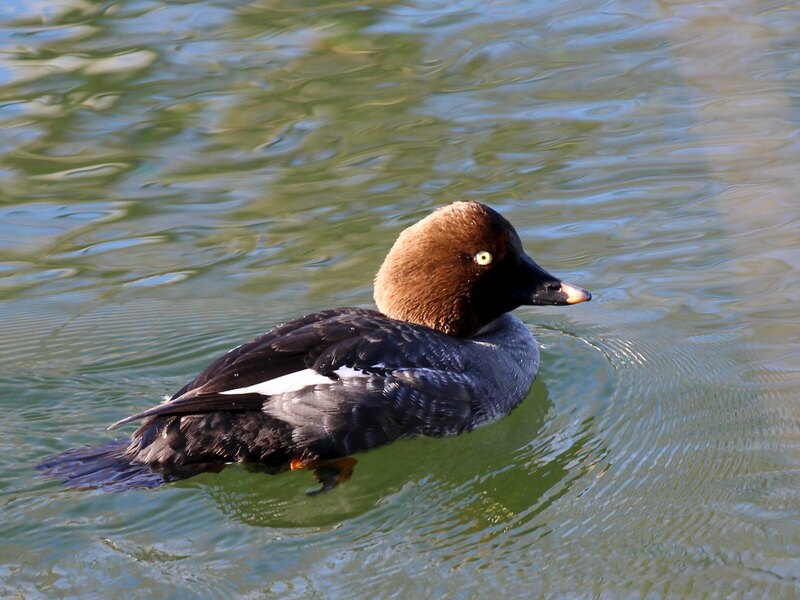 I took these photos from the walkway along the river, almost directly under the nest. We can see that the upper pile no longer bridges the whole width of its former support branches. 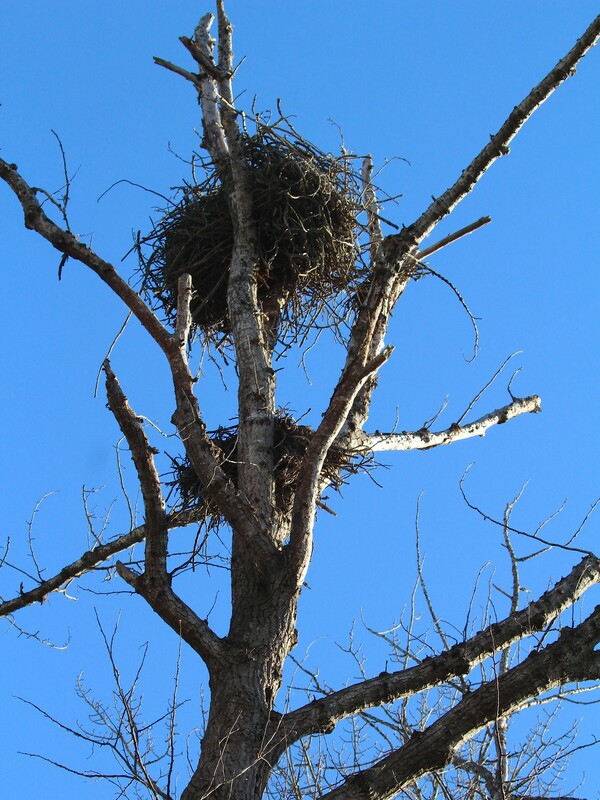 Those support branches are also all broken off just above the level of the old nest. This happened over the last 2 winters. Part of the nest fell and stayed stuck at the next level down, but this new pile seems interestingly compact and tidied up. 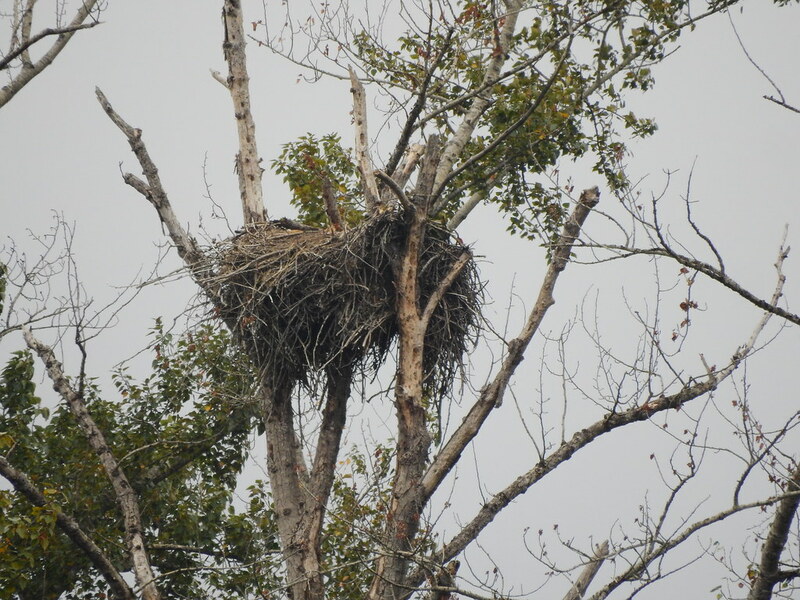 Dawn was wondering if the eagles are rebuilding a new nest from that lower pile. 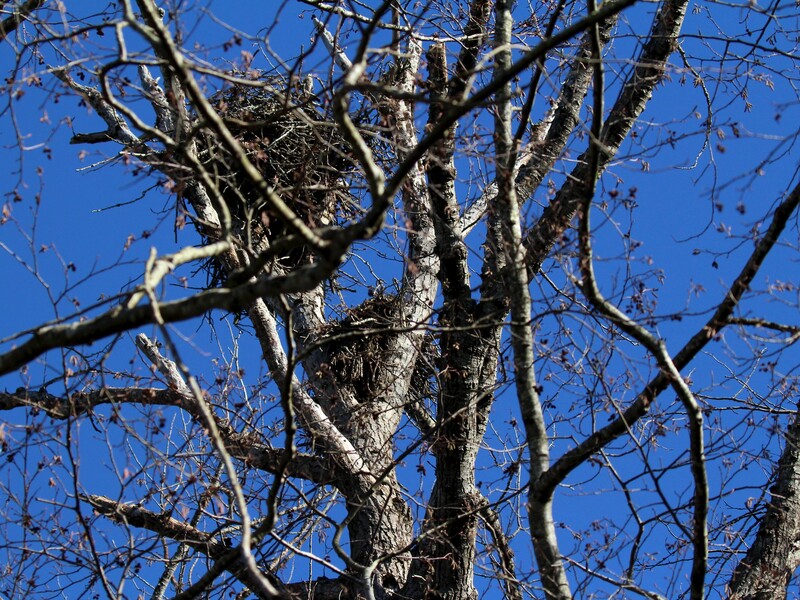 From my human eyes it seems like a safer spot, but I'm not a nest engineer like the eagles are. 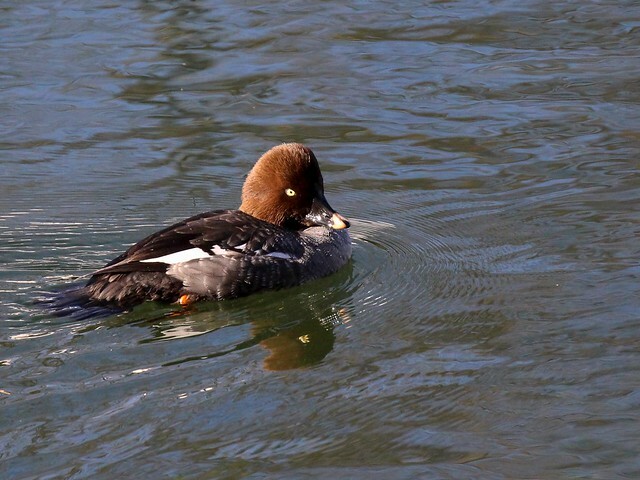 On my way to check the nest, I spotted this beautiful little duck: a female Common Goldeneye, swimming on the river just below the Simms nest.